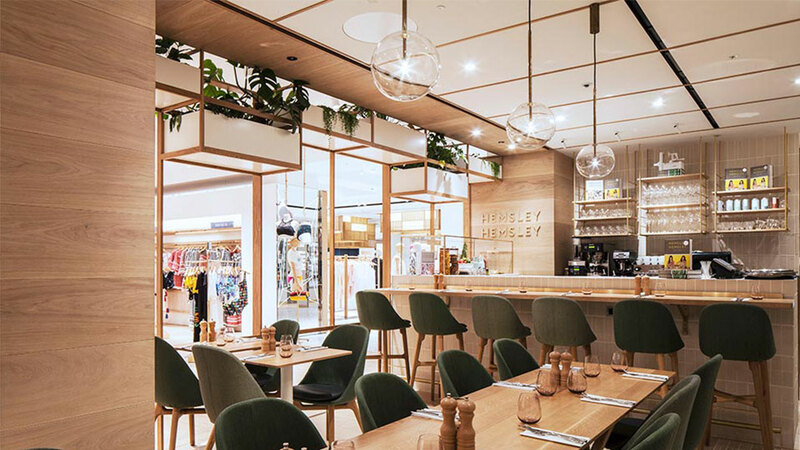 When we were asked to light up the first dining spot for healthy-eating duo Hemsley + Hemsley at Selfridges we got our clean living act on, spiralizers at the ready and excitedly set to work. 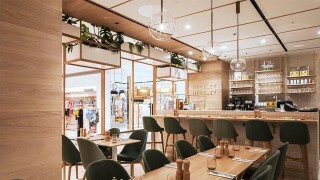 Located in the recently opened Body Studio (see our lighting scheme for that here), the café’s lighting design complements the wider interior design but offers a sense of sanctuary. The interior’s light and airy with bamboo-coloured walls and plants scattered throughout. It’s a mix of minimal Japan and California: clean lines, summer and simplicity. 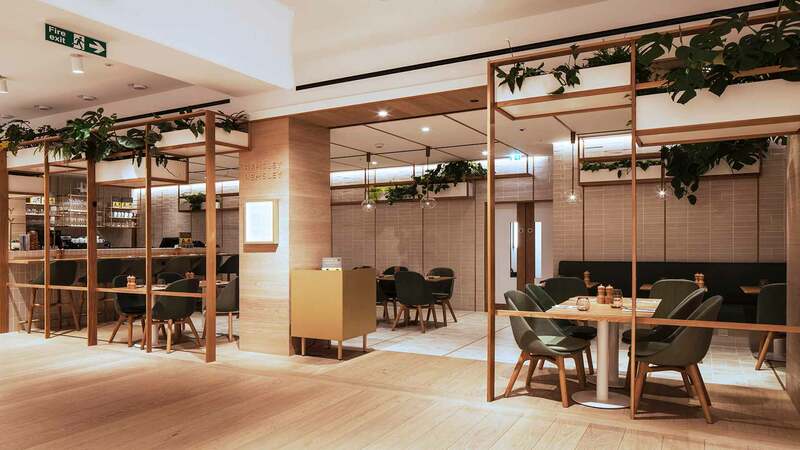 It was important to balance the effects of vibrancy and tranquility so we used three layers of illumination to bring out the natural tones and avert any lighting from the main retail area. Pendants hang over tables for intimacy; overall ambience is set at a different tone to the rest of the Body Studio, making it feel warm and calm; and soft lighting around the edge of the space blends the overall effect. Any challenges? Yes, trying to make it summery without any natural light. 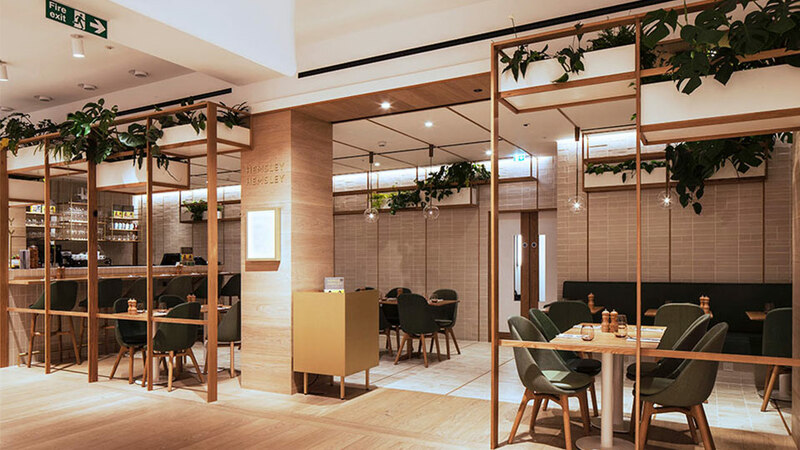 We soon sorted that by adding cove lighting with a concealed LED strip to highlight the back wall with a subtle wash of illumination; the lighting appears perfectly natural, like daylight. Lastly, let’s not forget about the grub: with delicious seasonal food on offer we used high colour rendering to highlight the quality ingredients and help bring the menu to life. 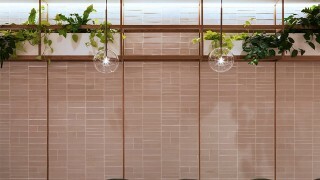 The challenging brief of creating an intimate lighting design scheme whilst keeping the space airy and open.